The Ice conditions in Conge are not too bad at the moment. There is a lot to climb and most of the routes are fat and formed, with only a few not in condition. I did not get pictures of “Flash Estivo” (WI-3) or “Fiumana Di Money” (WI-3) but they are both in good condition and have been climbed regularly. Below are a few pictures of some of the good looking routes in the Valnontey valley. These where taken on the 21/2/10. Last week Damien and I got an offer from a friend to share a ride to Cogne in Italy on Sunday. So yesterday we got up bright and early and headed into Cham to meet up with Charlie and a friend of his (Abbs) to head to Conge. Unfortunately Damo has been ill for the last few days and yesterday it was starting to take its toll on me as well. We both felt super week and had no energy but as we were already there we couldn’t turn down the chance to climb the mega classic WI-6 “Repentance Super”. Damien had already climbed this route last year but he was willing to do it again so that I could get it done (much to my appreciation). As soon as Damo started up the first short pitch he knew his body was tired and not working on all cylinders. So he quickly took a belay and I took over on the leading for the rest of the route. It was a good route with very different and strange ice features. It was different to any ice I had climbed before. Even though it was steep, the way it had formed made it not to strenuous, apart from the short bulging overhanging sections. We made a quick accent and then rapped off back to our bags. As we walked back to the car park we decided it would be best to make ourselves rest for the next couple of days until we both felt well again. We have got some big objectives that we would like to do in the next few weeks, so we want to feel good and get acclimatised soon so that we’re ready and fit for these. Cogne is an amazing place and I will definitely return to climb some more of its classic alpine ice routes. There is a lot in condition in Cogne at the moment and I will soon be putting a short conditions post on my blog so people can see what routes look good. 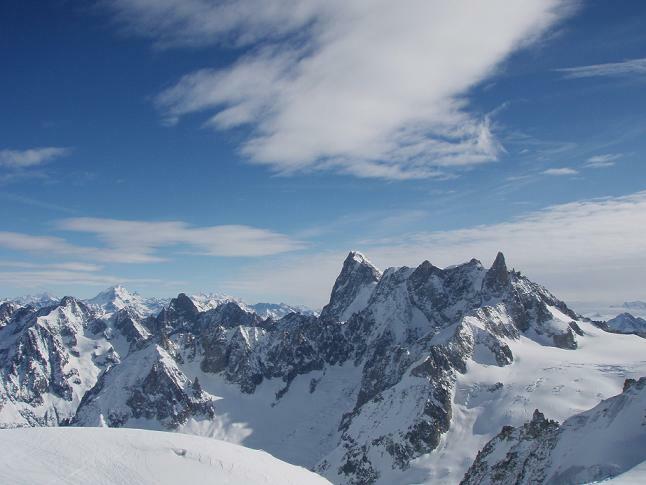 Hoping to do a mixed route on the Midi, Damien and I got up early and headed up to Chamonix to try and catch the first bin up the mountain. Unfortunately due to high winds the bin was not running and it looked like it would be a while before it would be. 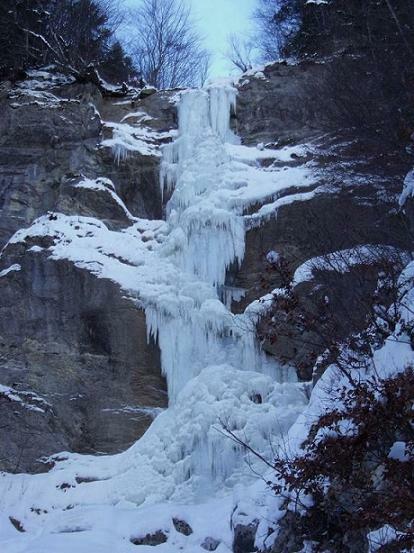 We decided to go and look at an ice fall near Bionassay. Damien had passed this cascade when he was ski touring in that area a few months ago. It is not in any guides and we did not know how hard it would be but we decided to go and give it a look. We followed a snow shoe trail into the woods but as a fair amount of snow had fallen recently the trail was very very deep. We persevered and continued along the trail, there were points when the snow was waist deep and it was starting to get very tedious (we should have gone back for our skis). When we arrived at the bottom of the cascade it looked good and fat but when we took a closer look we realised that there was a pretty impressive crack running straight through it. It had been weakened where the left hand pillar had fractured and fallen down. As the attachment point of the cone at the base of the cascade was also week and cracked we decided not to climb it. After wading through the deep snow for over an hour and a half to find that the ice fall was not in condition was a bit annoying. But as we walked back to the car we made our plans for tomorrow and we will hopefully have more of a successful days climbing if the weather picks up. Today Damien and I went drytooling at Le Fayet. 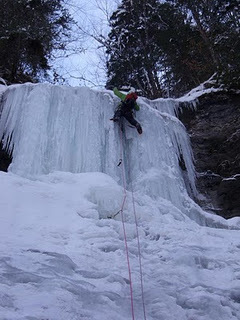 The weather was crap in the mountains and it wastoo warm to ice climb so we opted for a training day. It was good fun and we did some ok routes and got boxed out our minds so its all good. Back into the mountains tomorrow (hopefully). On Tuesday Damien and I decided to have a fairly chilled day, but we also wanted to make the most of the remaining good weather as it is forecast to go bad for the rest of the week. 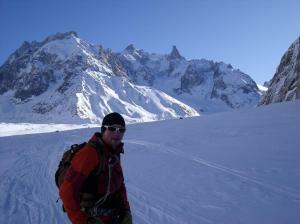 We headed up the Midi again and did “Cosmiques Aréte” which is a mega classic route in the Chamonix area. It was a good route with few difficulties but still very enjoyable. It was home to some interesting features in a breathtaking situation. We moved together for the whole route and after a few abseils, some mixed sections and just under 2 hours of climbing we arrived back at the Midi Station (just in time for a spot of lunch). We ate our lunch and watched the bad weather roll in over Italy, just as the forecast suggested. It was a good route and I think it definitely deserves its classic status. After we had packed our kit into our bags, we headed for the bin back down the valley and looked forward to getting up high again soon once the bad weather has passed. 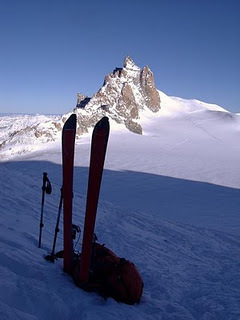 On Monday after Sarah and James had left to go back to Britain, Damien and I headed up the Midi to go out onto the Vallée Blanche to check out the condition of the high mountain ice and mixed routes. Over the past three weeks the routes have been getting fatter and starting to look good. There is much more to go at now and we are both psyched to get up high again soon. My sister and James have both been staying with Damien and I for the last week. We have mostly just been skiing and chilling, but on Wednesday Sarah had to catch up on some University work so James, Damien and I went Ice climbing. We went to “Notre Dame De Bellecombe” area and climbed two WI 6’s. It was James’s first time on European ice so we decided to give him a baptism of fire. 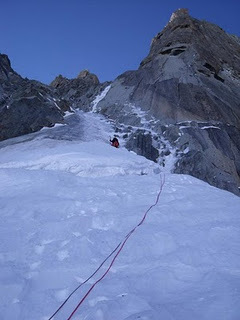 We climbed a route called “Gaidon-Jacquet” which was in super fat condition and was a bit easier than the guide book suggested (Damein lead this route). We rapped off and then I lead the second route which was a variation of the first route, also going at WI 6. 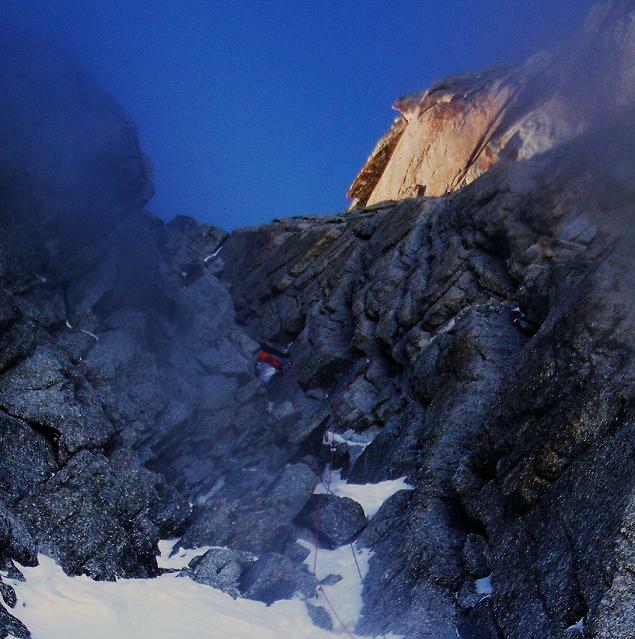 It was called (La Direct), it followed two steep pillars and continued onto a steep face at the top. They were both good routes and we all enjoyed the type of climbing this area had to offer. It is amazing how each water ice venue is home to such varied and different types of ice and routes. All in all it was a good day out and there was a lot more ice in the area to go at so we might be back for some more icy fun. Today Damo and I headed back to Flumet but to a different area this time. We went to “Nant de la coufia” area to look at what routes it had to offer. It had been snowing since we got up this morning and it was still dumping when we walked up the gorge to the routes. We walked up and looked at all the routes but most of them were buried by all the fresh snow, so we decided to go for a route called “Cascade Face N” (original name to say the least, guess which way it faces ;-P). The route is an 80m WI 6. Once we had decided that we would do this route, we made our way up to the base of the climb which involved wading through very deep fresh snow and some deep avalanche debris (it felt like swimming through treacle, except without the tasty sugary after taste!). When we arrived at the bottom of the route we decided which line we would take and then played the compulsory game of Rock, Paper, Scissors to decide who got the first pitch. I won so I was up first. 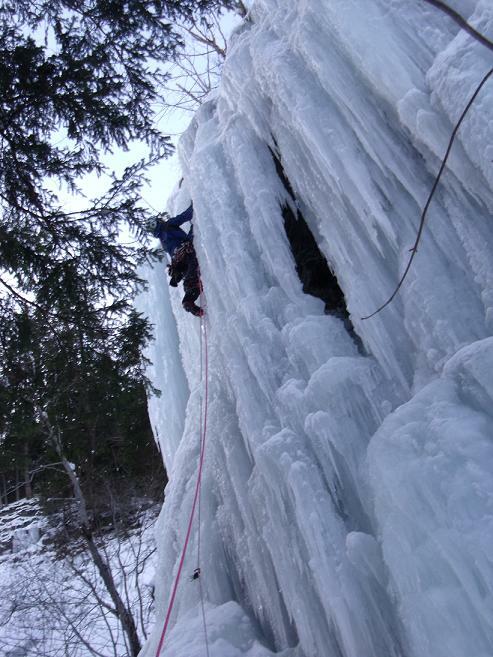 I quickly climbed up to an ice bulge below the steep second pitch and took a belay. I chose this place for my belay as I thought It would be free from ice fall when Damo started up the last pitch but also because it would be a great photo spot. I soon found out that I was wrong and as Damo started climbing above me I started getting pummelled by ice, so we decided that I would moved up to a cave below the first steep step. This spot was much better as I was sheltered from the heavy snow that continued to fall and the ice that was getting knocked down. I also got a good view of the climb, which is always a bonus. Damo made a quick ascent of the top steep pitch which was home to some awesome climbing and nice ice. Once I had ventured out of my cave and seconded the pitch we rappelled back to our bags, which had been buried by the snow. We dug them out and headed back to the car. Even though the weather was pretty minging, we were happy to have got some climbing done. On the 3rd (my birthday) Damien and I headed off to Manigod area to climb some ice falls we had read about in the guide. We climbed two routes, the first was a 60m WI 5 called “Adrenaline” which is regarded as a local classic. 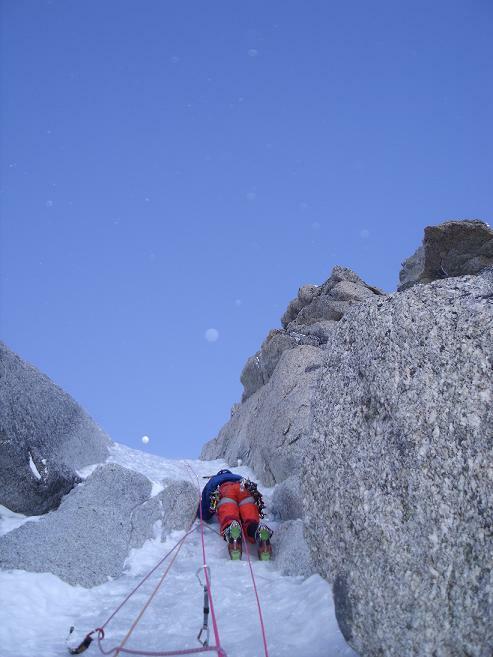 We climbed it in two 30m pitches which we felt were both worth 3 stars and around grade 5. 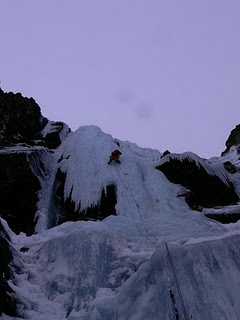 There was another team on the route but they were finding it quite hard and intimidating so they asked us if they could use our pre-placed ice screws on the top pitch, which we agreed to as they seemed to be nice guys (and we could see a total epic arising if we didn’t). Once they had returned to the bottom and given us our screws back we walked back through the snow covered forest to the car and made the 5 minute journey to the next route. This route was a 200m WI 4 which is also a mega classic of the area called “Le vaisseau de pierre”. 7 ice screws later and 40 minutes of moving together and we had completed our second route of the day. It was an enjoyable route with awesome scenery and amazing surrounding rock formations. This 3 star route is a must for anyone operating around grade 4, with a ten minute approach and bolted belays giving a stress free ascent, or even if you just move swiftly together up the route it is still good value. Walking off from the top of the route we watched the sun set on the mountains of the L’Arvais which made for a good end to the days climbing and also a good end to my 19th birthday. Hopefully this year will bring just as much climbing and fun as the last. Today Damien and I headed to an area we had not yet been to. We went to Flumet hoping to climb one of the routes in the guide. After a lot of driving around in circles in the town of Flumet trying to decipher the guide description on how to get to the routes we finally got on track and waded through 2km of deep snow to the ice falls. When we arrived at the foot of the ice falls there was much to be desired. They had a lot of snow on them and they didn’t look to inspiring. We walked on a little and found an ice fall that was not in the guide that lead up to the road, we don’t know if this route had been climbed before but we can’t find any info on it and it had not been climbed this season. The route had a short 30 meter WI 4+ section to start and then a 50m grade 2 snow and ice pitch (a bit rompy), after this there was a steep 10m pillar which we thought looked like a “short steep step” from the bottom of the route (oh how wrong we were!). This pillar turned out to be very tricky and much harder than it looked. Although it was not too long it was formed entirely from thin hanging icicles, the ice was not consolidated and it was super brittle. Every screw I placed was useless apart from the last one which made me feel better for the top out and every axe placement felt like it could rip at any moment. I tunnelled my way up the middle of the pillar, which involved clearing away the icicles from above and fighting to find solid axe placements (very tiring). I finely pulled over the top and took a belay, but not before my foot blew as I was pulling over the top of the pillar and I thought I was off, but my axe held and I was ok (which is a bit scary when all your screws are totlay crap!). The last short pitch had a 5 meter fan of ice that was ok until you got to the top where there was no ice and it was just a rock slab above, which made the top out a bit spicy to say the least. Damien and I both thought the route was very technical and hard. Even though the hard section was not very long, it was steep, the ice was very technical and the screws where no good due to the ice conditions. Because of this we gave it WI 6, and even though it might have been climbed before, we called the route “one short step” just for our amusement.